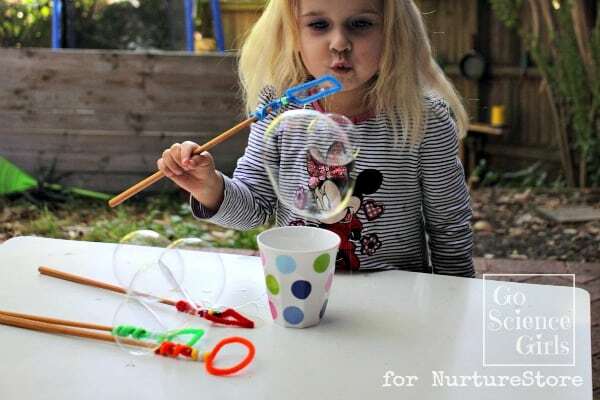 Danya from Go Science Girls is joining our our ABCs and 123s series today to show a fun way to introduce shape recognition into backyard bubble play, and explore a little bubble science at the same time! There’s a certain 3.5 year old at our place who is obsessed with bubbles! Maybe you have one at your place too? Bumble will chase and pop bubbles all day long if she has the chance. 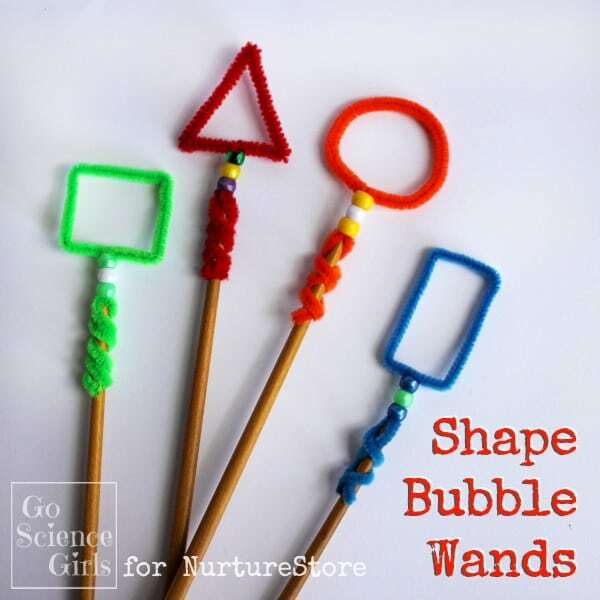 So I thought I would see if I could tap into this obsession and introduce a little basic geometry practice into Bumble’s bubble play, and explore some age appropriate science concepts at the same time. 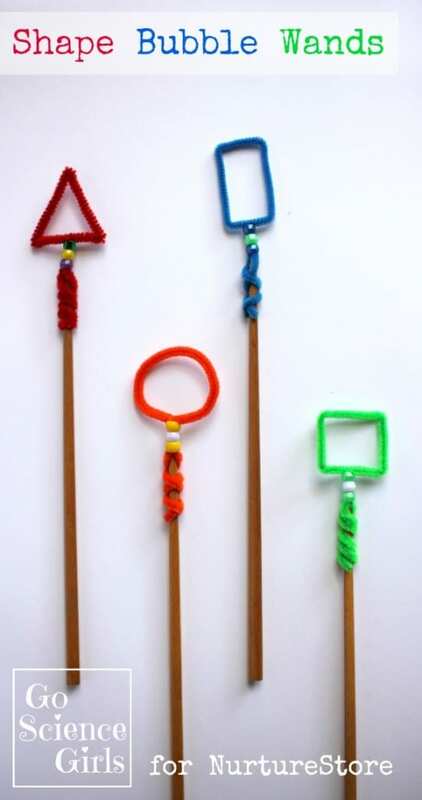 Bend a pipe cleaner to create a basic geometrical shape, leaving at least 2 inches on each end free. 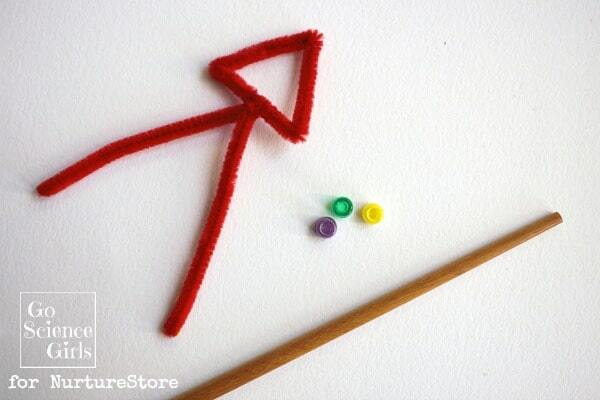 Twist the pipe cleaner at the base of the shape, and thread on a few pony beads for decoration. Then split the ends and twist tightly around a chopstick, which acts as a handle. I made a triangle, a rectangle, a circle and a square shape. You could also try trickier shapes like ovals, crescents, stars, hearts, pentagons or hexagons. We’ve even made Easter egg shaped bubble wands before – see what you can come up with! 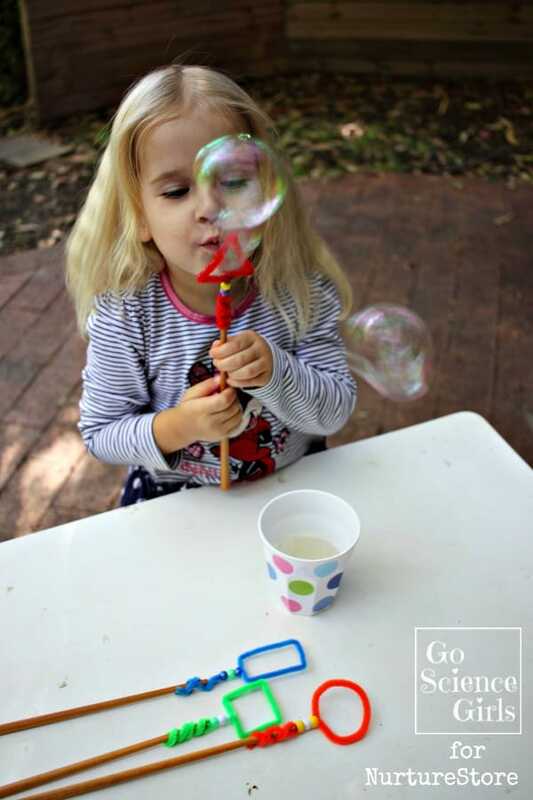 We took our new shape bubble wands out to the backyard to test them out. I poured some bubble mix into a cup, so Bumble could dip the wands and blow the bubbles herself. It was a good chance to revise Bumble’s geometry knowledge, and talk about the various shapes, how many sides they have, similar shapes we see in everyday life, etc. Bumble tried creating bubbles with the circular bubble wand first. I asked her what shape the bubbles were going to be, and she said she thought they would be circles! She tried it out, and saw they were actually round like a ball. We talked about how this shape is called a sphere. Then she tried the triangular bubble wand. I asked her what shape she thought the bubbles were going to be, and she thought this time, they would be triangles! She was quite amazed when the bubbles still came out round. She tested all the bubble wands in turn, and yes, they each made round bubbles. Very interesting! Our (store-bought) bubble mix is made up of (mostly) soap and water. The soap makes the surface tension of water weaker than normal, and also forms a very thin skin (or film) that is flexible, perfect for making bubbles. Bubbles are actually a film of soapy water with air trapped inside. There are two forces occurring here: the air inside the bubble is pushing out, whilst at the same time, the soapy film is pushing in. To balance these forces, the soapy film assumes the smallest surface area it can, and that shape (in the absence of other forces) just happens to be a sphere. This is why bubbles that float in the air are round. I haven’t actually explained these various forces to Bumble just yet. I don’t want to overwhelm her! At three and a half years old, it is enough that she ponders, hypothesizes, experiments, and is amazed by the whole experience. She’s learning that science is fun, it’s OK to prove a hypothesis incorrect in science, and bubbles are trickier than they seem! Danya is an Aussie stay at home mother of two little girls, both of whom are fascinated with science. She started Go Science Girls as a place to share some of the playful science activities they get up to at home, in the hope to encourage and inspire both her daughters, and other science-loving girls around the world. Subscribe to their newsletter and receive lots of fun science activities via email.